This silver and black desk plate is engraved with "Director of First Impressions" and is a great gift for your receptionist. 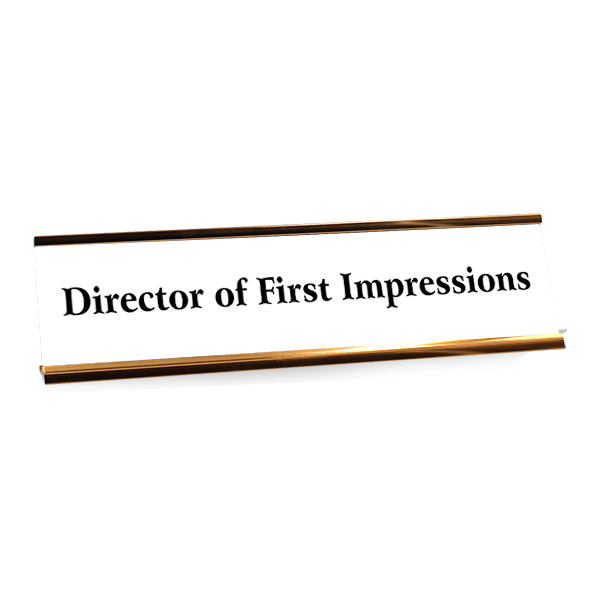 Patron Parking Only Aluminum Sign | 18" x 12"
ADA Sign Horizontal 3" x 24"
As soon as visitors approach your front desk, make them feel welcome with this funny engraved desk plate that reads "Director of First Impressions." This funny desk name plate is great for front office staff, receptionists and other team members who make first contact with your clients. Beautifully made, the 2" x 8" desk plate makes its own welcoming impression for any passerby.